You already know that I was reading Someone Knows My Name for about three years. My bookmark was proof it’s been at least that long. 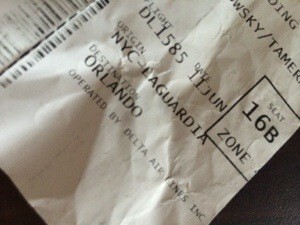 This boarding pass was from my first trip to Orlando in June 2010 with my buddy Alaa. I can’t tell you if I started reading the book then, but it’s an indication of the all the journeys this book has been on with me. Time does go faster as you get older. Must be all the fun!